Our Kos resort guide is designed to help holiday makers, day trippers or travellers decide which towns and villages to visit whilst in Kos. Kos offers a lot of different resorts for the holiday maker, from the capital Kos town to the smaller Kefalos or the always lively Kardamena there’s a plethora of choice and this page is designed to help narrow down your choices. The main tourist resorts in Kos are dotted around the island, There’s Tigaki on the north coast, Kefalos in the south west, Kardamena in the south and Kos town in the north east. Which one you choose will depend on what you’re looking for. The resorts on the north coast, Tigaki, Marmari and Mastichari are all perfect for families, they have good beaches, a wealth of hotels with pools and loads of restaurants, shops and travel agencies. If you want to get away from the popular resorts and see something a bit more traditional Greek, why not try heading to the south west corner and visiting Kefalos, it’s a quaint village in the hills and a lovely place to spend the day. Zia is another popular traditional village, it’s up in the mountains and has several restaurants that are filled with people who come to enjoy the sunset views. Kardamena is the 18-30 resort on Kos, it has an endless amount of bars and a handful of clubs, it’s not as hedonistic as the likes of Laganas in Zante but it’s perfect for a lively evening out drinking. 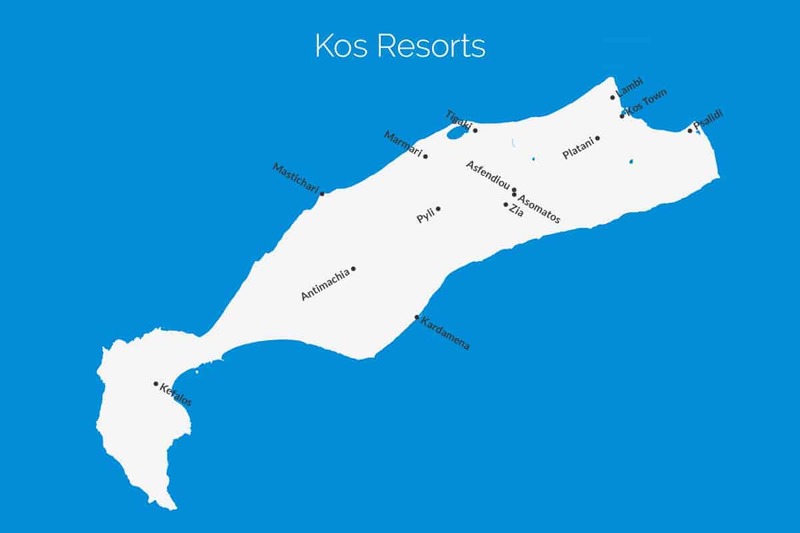 We’ve listed below the main resorts on Kos, all you have to do is click the heading of the ones you’re interested in and that’ll take you to a more in depth look at that particular resort with a description, photo, quick guide icons, a map and hotel search. Platani is a small village on the outskirts of Kos town and lies roughly half way between the main port and the ancient Asclepeion. We want Which Greek Island to be as accurate and informative as possible, so, if you notice anything wrong with the Kos resort guide or any other page please let us know. We’re also on the lookout for great photos to show people what the places we’re describing are like. If you have photos from any of the resorts in Kos or from any of other island on the site then we’d love to see them, simply click the button below to go to the photo upload page. Thanks.